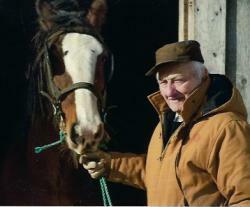 The death occurred peacefully, at the Western Hospital, Alberton, on Thursday, December 20, 2018, with the love and support of a loving family, of Peter Gerard (Gus) Ellsworth of Nail Pond, PEI. Beloved husband to Bertha Mary (nee Gallant) Ellsworth. Peter was the son of the late Augustine and Josephine (nee A'Hearn) Ellsworth. Loving father to Michael (Jan) of Peter Road, Wayne (Jody) of Nail Pond, Linda (Jason) Ellsworth of Tignish, Kelly (Terry) Gaudet of St. Peter and St. Paul, Pat (Amanda) of Cascumpec, and Steven (Kerri-Anne) of Nail Pond. Cherished grandfather to Tommy, Tyrone, Jerico, TJ, Mikayla, Emma, Allie, Kaylee, Gus, Jack, Raylee, Toff and Jade. Dear brother to Laura (A'Hearn) Kilbride of Summerside. He will be sadly missed by his many nieces, nephews and friends. He was predeceased by siblings, Macarius (late Thelma), Richard (late Mary), Gussie (late Jean), Chester Sr. (late Alma), and Helen (late Levie) Handrahan. Resting at the Rooney Funeral Home & Chapel, Alberton, for visiting hours Sunday, December 23, 2018, from 6:00 to 9:00 p.m. Funeral Monday morning from St. Simon and St. Jude Church, Tignish, for funeral mass at 10:30 a.m., Rev. John Molina, Celebrant. Interment in the Church cemetery. As an expression of sympathy, memorials to the St. Simon and St. Jude Building Fund would be gratefully appreciated.